Coolestmommy's Coolest Thoughts is pleased to offer this giveaway which is hosted by Tammie's Reviews, Giveaways and More and sponsored by Good Cook. The 3 piece Fresh Fruit Bowl is only available from Bed Bath and Beyond. I love fresh fruit and find I eat so much better if I keep fresh fruit on hand. I don't know about you, but when I purchase watermelons or other melons, I have trouble keeping them fresh long enough to eat all of them. I often have to toss the last of the melons because it got gross or spoiled before our family could eat all of it. So finding out about this bowl is incredible. I can't wait to go purchase and try it for myself. From Tammie: Summer is here and for me that means cookouts, vacations and fresh fruit. I love all things fresh fruit. I do not thing there is a kind of fresh fruit that I would not eat. I love to visit my Mother-In-Law as she always has a bowl of fruit salad in her fridge. I have noticed that the fresh cut fruit started to taste funny- soggy and old. I do not know if you know what I am talking about but I was just introduced to a 3-piece fresh fruit bowl that I can only describe it as amazing. It keeps watermelon and cut fruit fresher longer. The 3 -piece fresh fruit bowl comes with a large bowl that sits in another bowl that collects the liquid from the first bowl and a lid. This product is only available at Bed Bath and Beyond. 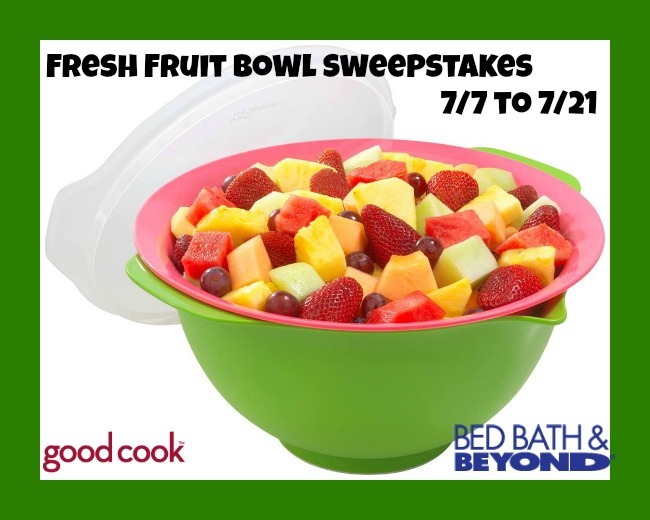 One reader will win a Good Cook 3 piece Fresh Fruit Bowl. Only 1 winner per product- This means if you have won the same product on another blog, You are ineligible to win. Please enter using the easy Giveaway Tools Widget below and Good Luck but here is another chance to win this same prize on Natasha's blog by clicking HERE. Id put peaches and strawberries. All kinds of berries. I'm a berry fiend!